At AMD's GPU14 Tech Day event in Hawaii, the company announced a partnership with Raptr to bring a new application designed specifically for game setting optimization. 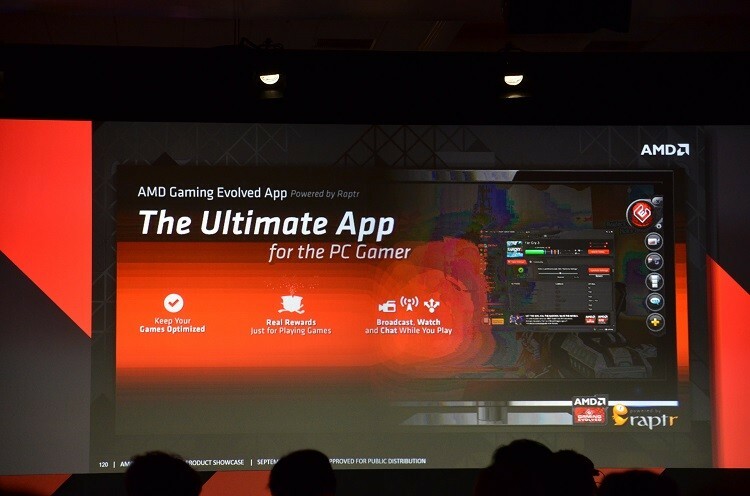 Similar to Nvidia's GeForce Experience announced last year, AMD's Gaming Evolved application will analyze your setup and download information from the cloud so you're running games at the optimal settings. Raptr will bring in a crowd sourcing aspect to the Gaming Evolved application. Instead of having a bunch of technical guys sitting at desks and analyzing system performance all day, the Gaming Evolved application will pull information from other users and their setups to produce configurations. You will be able to choose from three configuration targets: Performance, Balanced and Quality, the latter of which is the default setting. The Gaming Evolved app also incorporates other aspects of the current Raptr app, including social connections, quick broadcasting to social media, in-game tools such as a web browser, and the ability to earn rewards just from playing games. Initially the app is designed to work with any PC, desktop or laptop, that has a current generation AMD GPU inside, although support will expand to older cards in the future. Raptr also states that only 28 game titles are currently supported for optimization, although the team is working hard to add in more games. If you have an AMD GPU and are interested in checking out the AMD Gaming Evolved application, you can download a beta version from our download section now.